"I feel I have delivered four babies in one go. I feel so light and empty in the stomach," says a farmer from Bikaner who got a 10-kg tumour off his stomach after a gruelling surgery. 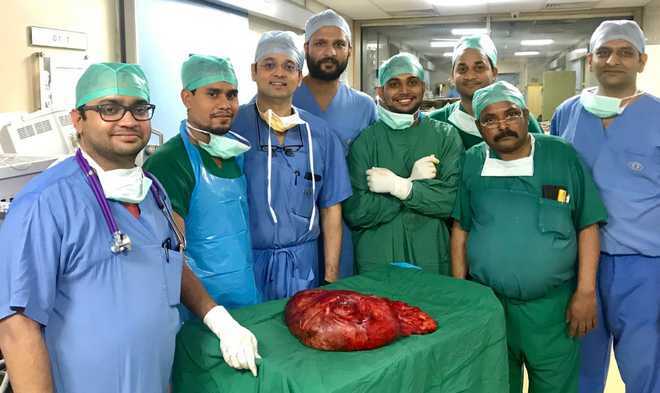 The operation lasted for over 10 hours and when the tumour was finally removed by a team of specialists at Sir Ganga Ram Hospital, the weighing machine at the facility fell short for the same. Dr Ushast Dhir, the chief surgeon for the case says the tumour had left no room in the abdomen to operate. The surgery to be successful required removal of the tumour in one piece without damaging the vital organs and their blood supply. This required precise dissection of the tumour separating it from liver and its blood supply, intestines, right kidney and other organs, Dr Dhir explained. Specialists say the most complex part of the surgery was separating the tumour from renal veins and aorta without blood loss or damaging these structures. The tumour weighed over 10 Kg and was two feet long. To our knowledge this is this largest liposarcoma (cancerous tumour) removed until now, said Dr Dhir. The farmer was suffering from discomfort in his stomach for the last six months. He always felt bloated and was not able to eat. He had lost more than 10 kg weight in three months and was recently unable to lie flat on the bed or breathe easily.